Mix together some Oxiclean with a little water to make a paste. Spread the paste on the stain and scrub the stain with a bar of Fels-Naptha and Oxiclean paste. Wash as usual. I usually take a chef coat that is toward the end of it’s life and try it with bleach first to make sure the embroidery will not fade. So far, none of them have, but it’s always best to try on one you don’t care about losing just in case. 🙂 I have had good success with using laundry detergent and about 1/2 to 1 cup of bleach per load, starting the cycle on the washer and letting it run for about 10 minutes and then stopping it and letting the coats soak for 2-3 hours. Then I start up the washer again and let it finish. I always use a second rinse. After I’ve tried everything else, a bleach pen is my last option. I spread the gel on the stain, let it set for about 10 minutes and wash it. Add to regular wash cycle to help keep coats white and to prevent them from turning yellow. I’ve had success in the past putting some liquid dishwasher detergent on stains before washing the coats. Just make sure to read the label to see if it contains bleach. If is does, make sure not to leave it on the stain for long or it will yellow the coat in that one spot. (I’m speaking from experience here.) It’s worth a try if you already have some in the cupboard, right? Make a paste out of bicarb (baking soda for those of us in the U.S. – yes I had to google it) and water and scrub it into the stain. Rinse off with white vinegar and wash.
To remove ink stains from chef coats, squirt hand sanitizer on the ink and scrub it. Let it sit for about 10 minutes and wash it in hot water. More details here. Once a week use this treatment on your coats to keep them bright white. Squirt directly on the stain and scrub with a toothbrush. Wash as usual. If all else fails, use a garbage can and lighter fluid or possibly use them for an end of the summer bonfire! 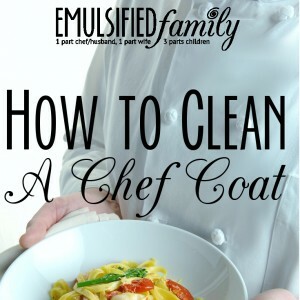 Have I left out any other amazing ways to clean a chef coat? 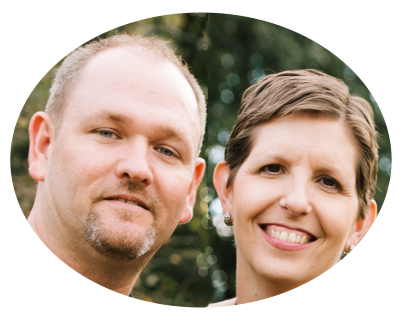 If you have found something that works for you, please leave a note in the comments so we can try it! Reading this makes me so thankful that out of 15 chef coats, only one is white!! He prefers black, thank goodness. 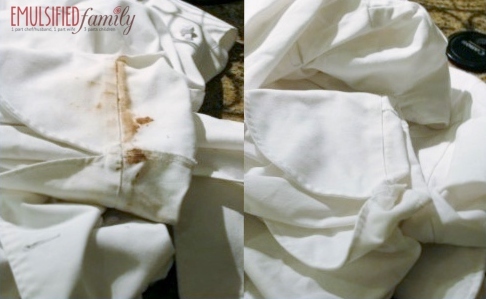 I do remember how much of a pain it was to clean my own white chefs coats though! I strictly keep to colors and absolutely no whites! I wish black was an option. 🙂 Do you have trouble with grease stains on black coats? I have happily survived 8 1/2 with my chef. I have learned a very good way to make the chef jackets “stain resistant”. Old fashion heavy spray starch. I like niagra. I take his jackets out still very slightly damp , hang them . As I iron , I spray, heavily every inch , all the way to the hem. Yes even the back. I iron in panels -seam to seam. Not only does he look sharp but you’ll see the liquids and grease will literally roll off. Be careful with bleach pens . -A lesson learned the hard way- if you don’t wash shortly after applying the bleach can eat the cotton and you will find a weak spot or even a hole. Great idea. I don’t have to iron my husband’s current chef coats, but might think about doing it anyways, with starch, just to try it! Thanks! And good reminder about the bleach pen! Black chef coats . . . lucky!! Thanks for the tip about the Simple Green Aerosol Degreaser. I’ve never tried that but will look into it! So…since burning really isn’t an option…right?! LOL. My favorite trick to add to any of your above solutions is a good ole fashioned toothbrush.The dry stiff brush will get at the stubborn food still stuck to the jacket, and once its wet with some soap preference you can scrub and really get to the stain at the fiber level. 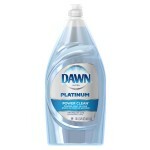 My favorite soap currently is the new DAWN platinum. It just really seems to be able to break the food stains best. But I will now go in search of the Netepur bar…. Love the dry cleaning business idea! I will have to try a toothbrush on a stain soon. I love Dawn, but just use the regular one. Do you think the platinum one works better? 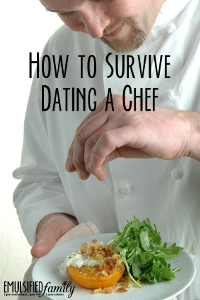 I have been dating a chef for just over a year now. We moved in together pretty early on (6mths) because we felt strongly for one another and knew it might be the only way we would ever get enough time together to really build a relationship! So while I am on the newer end of the spectrum of relationships I am definitely immersed in the world of a chefs partner, including laundry! I personally strongly prefer Dawn Platinum as well. It bills itself as “the power of an overnight soak in 3 min” and it does not disappoint! Another great thing to do with old white chef coats is tye-dying them at a summer party. I have used the Dollar Store generic Oxiclean and that has helped not only get stains out but the horrid stink of friolator. Thanks for the tip about the generic Oxiclean!! Maybe we’ll have to tye-dye some chef coats this summer. The girls would love that!! Thanks Veronica. I hope the tips can help you with getting food off of regular clothes too! I have been married to 2 chefs and I fill a huge bucket with oxy clean, cascade, and whatever else I have on hand and let them soak for days before washing and hang drying. He always gets compliments on his jackets at work. To get the stench out, use crystals in the wash. I am going to try the RIT after reading this and was thinking about trying a water repellent or stain guard on the new jackets. Do you ever dry the coats in the dryer or just hang them dry and then iron them? Thanks Jennifer. It really is great that you share experience with cleaning and removing the dirtiness. Any tips on removing carbon? I think it’s from cleaning stoves/grills. It’s pretty set in. I have tried shout, oxyclean, and bleach! Also tried scrubbing with dish detergent! Carbon is horrible. 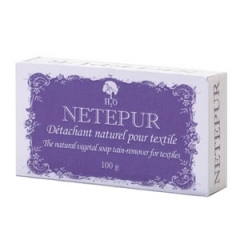 I had some luck with a netepur bar when it was fresh and hadn’t been washed yet, but even a bleach pen only faded it a little bit after I had been washed and dried it. Carbon is one of the only things I really struggled with, and I know it’s common because you brush up against it on the bottom of pans. Usually if he wore an apron, there was not too much of a problem with carbon. But when he would forget or was out of aprons, that’s when it was a problem. If you have one that is really bad, I would put a couple cups of bleach in a full load of water in the washing machine and let it soak. 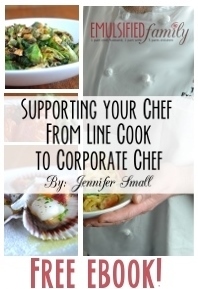 It might work, it might ruin the chef coat, but it’s worth a try before you throw it away. I’m not sure if that is helpful or not, but good luck. Hello, my chef whites has some coloured prints, and can I wash them in any of the products that u suggested. All of my chefs colored embroidery on his chef coats have not faded from OxiClean or the netepur bar. If you have a coat that is really bad, and you can’t really wear it anyways, I would try soaking it in Bleach. I was actually able to bleach a lot of my husband’s coats even with colored embroidery, as they use some special kind of thread on them. I obviously can’t speak for your chef coats, but it might be worth a try. Just be willing to lose a coat if you are going to try with regular bleach. I usually waited to do that until we had one we were willing to throw away because it was so bad. Good luck! I use Dawn dish soap on my chefs along side reagular washing powder with good overall results. I do throw regular bleach in also. The one thing I do have problems with is the rub off stains from the stainless flat grills when I don’t wear an apron. Haven’t found a way of getting those out and after a few washes, that grey kind of spreads to the rest of the coat. Will try the rits product to see if that helps. Thanks Deb. Aprons are a lifesaver as those rub off stains from the grill or the bottom of pans are horrible!! Good luck!